More and more, our patients are adding Waterpik electric flossers to their dental health routines. We see the good results in their checkups. Now, with new technology, Waterpiks have become an even more valuable tool to benefit your oral health. Waterpiks remove plaque from the teeth using a stream of water along with some massaging action that benefits the gums. The high-pressure stream can clean deeper into the gum line than string flossing can, and it is a recommended flossing method for braces, bridges, and veneers. Some people floss only with Waterpiks, but most dentists advise using both. If flossing your teeth every night is a chore you’d rather avoid, you’re not alone. Delta Dental reports that fewer than half of Americans floss that often, and 20% do not floss at all. Among the excuses: It’s too difficult, and it hurts. But brushing your teeth twice a day, as recommended, isn’t enough. Your toothbrush can’t reach all the spaces between the teeth that harbor plaque and bacteria. Plaque that remains on the teeth is what causes tooth decay and periodontal disease. Flossing correctly once a day helps disrupt the process that allows plaque to form, but the resistance to flossing is hard to overcome. 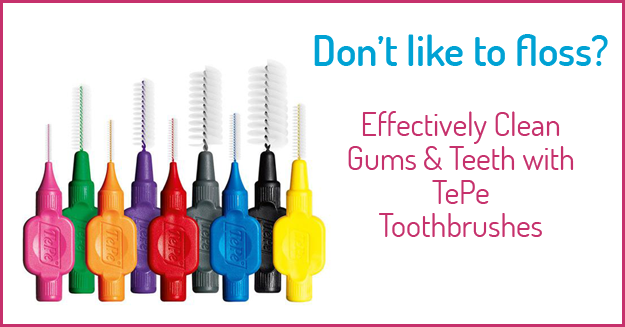 Because removing plaque is so essential to the health of your teeth, and to your overall wellness, we offer our patients an additional option: Tepe interdental brushes. Dr. Lamberton and his staff are extraordinary. Each one of them goes out of their way to ensure your dental visit is pleasant, comfortable and pain-free. Nicole at the front desk is a breath of fresh air that greets all patients, and her warmth immediately welcomes and reassures any nervous patients. Dr. Lamberton’s work is the best I’ve ever seen. He is meticulous and a true professional. Probably the best dentist in Napa Valley.